Enhance your yard’s appeal with an EMSCO landscape rock! With its natural color, this artificial rock has a natural appearance that blends well with gardens, lawns, and landscapes. It’s natural-looking exterior also has a realistic texture that will add a feel of authenticity to your lawn. With dimensions of 20.5” x 25” x 18” (height x length x width), this plastic rock is easy to install and lightweight. Each rock has two stakes included to anchor the product securely to the ground. It is also lightweight, so you can pick it up and place it anywhere in your landscape. Each artificial rock is durable and resilient, as it is able to withstand extreme weather conditions. It has a high-density resin construction that displays a very sturdy and realistic-looking structure. Polymer-made, these rocks have two stakes included so that they are anchored to the ground and remain upright even against extreme thunderstorms and intense gushes of wind. This natural-looking rock can also be placed over wells, pipes, pump, sprinkler valves, and other fixtures to block them from sight, thus enhancing the aesthetic of the terrain. It can be used to cover up utilities in lawns, yards, or landscapes. It also accentuates the greens of lawns with its neutral surface shade. EMSCO has a complete line of boulders and stones available in their catalog. They offer rocks of various sizes, along with an assortment of detailed textured rocks. The list showcases a variety of colors, shapes, and sizes, so you can choose your preferred style to match your lawn and landscape needs. Decorate your landscape with only the best by using EMSCO Landscape Rocks! LARGE SIZE – The rock's overall dimensions are of 20.5” x 25” x 18” (height x length x width). Please keep in mind that the rocks have an irregular shape and are tapered. To determine the best size for your application, please review the rock dimensions photo showing variations in both height and overall footprint. NATURAL TEXTURE AND APPEARANCE – This architectural rock has a natural appearance that blends great with gardens, lawns, and landscapes! 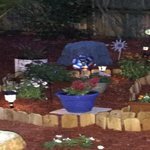 COVERS UP LANDSCAPE UTILITIES – The rock can be placed over wells, pipes, sprinkler valves, and other fixtures to block them from sight, thus enhancing the landscape’s natural beauty. OTHER ARCHITECTURAL ROCKS AVAILABLE – EMSCO has a complete line of landscape rocks available. The rocks come in many different sizes, along with an assortment of detailed textured rocks. I needed this in my garden area to cover a sprinkler head and lines that are exposed to the elements. It fit my needs perfectly and looks great. Easy to place in the ground and the stakes keep it from shifting. Overall the product blends in well and should hold up for future years. I bought this to add interest to a rock garden and flower bed, rather than cover and hide a utility post. This rock looks real sitting among my roses and day lilly flowers. Buying a large landscape rock/boulder from a garden center is not only expensive per pound, but there are delivery costs, and once in place difficult to move. I like the versatility of being able to move this rock around easily. I purchased these to use on a Mardi Gras float. They are perfect for what we need and look very authentic. The wall thickness was more than I expected and they are heavier-duty than expected. It covers up my well in the yard, so no one will be hurt on it. The rock looks much better and is easier to see than a pipe sticking up out of the ground. I wanted to cover some above ground piping in my backyard where I planted a garden. The piping served a well that had collapsed. I opted for this in lieu of cutting out the pipes. Simply measured the area I needed to cover (H/W&L). Was very happy with the look as it looks real. It's very light weight and the textured appearance is quite realistic. For me it was well worth the cost. I recommend it. In the pics the "rock" is right behind the R/W&B spinning wheel. Pic taken at night. The "rock" is more of a lighter gray, more realistic than the photo implies. Is there an opening in the rock for hiding things inside it? If not, do you know of any resources you could direct me to that may? 1. If your talking about a secret compartment then no. The rock is completely hollow and depending on the size of what your covering you could hide something underneath. However, it&#39;s really not made for that purpose. 5. Our rocks do not come equipped with a hiding spot for a key or other items. We do not sell anything of this type. Good luck in your search. Does the EMSCOGroup Boulder Statuary Rock Walmart # 553245945 have stakes to secure it to the ground? 1. Good Morning and thank you for your interest in this product. This particular size rock does not come with stakes to secure it to the ground. It is designed to have a small trench dug around it and placed in as it is a particularly heavy piece. However, the walls of the "rock" are of a thickness that a hole could be drilled into them and a small metal stake of your choice could be placed it the ground that way. Once again, thank you and enjoy the remainder of the summer season. 2. No, they do not have stakes to secure to the ground. The boulder rests directly on the ground. what are the dimensions of this fake rock? 1. This product measures 16.125 x 15.375 x 20.75 inches. 2. This rock measures approximately 16.5" high x 20.25" wide x 15.5" long. Thank you for your question and good luck. Warranty Information:Unless otherwise stated, all EMSCO Group products have a 1-Year limited manufacturer's warranty effective from the date of purchase.